Boston, one of our favorite cities in the USA and one that is going though a lot this week. As we all know, the Boston Marathon finish line was bombed, leaving death casualties, injuries, and a lot of people shaken up (read more about it here). Please send your healing thoughts and prayers to those affected and their families. In light of all this negativity, I wanted to shed some positive light on a few of my (new) favorite things in Boston; more precisely, those we experienced while on a Boston Foodie Tour this past month. During this sneak peek of the new Back Bay tour, for about 3 hours we traveled through this historical and food-filled section of the city. 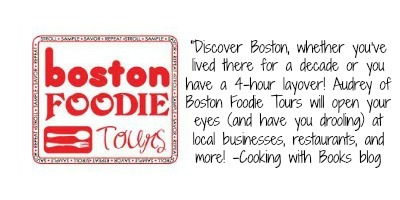 Boston Foodie Tours not only does tours of the Back Bay, but also of Beacon Hill, Faneuil Hall & North End, and more. Our tour took us to various spots – restaurants, shops, and bakeries. We’re happy to share a visual tour below of the good eats! 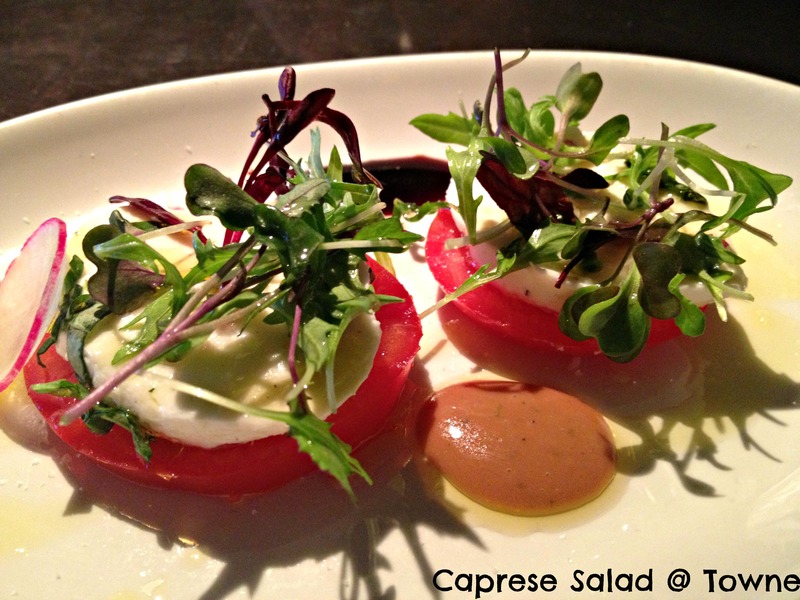 A light and gorgeous tomato and mozzarella salad was presented to us to start our tour. We actually got to sit at the owner’s table (good thing they didn’t show up mid-salad!) and had a great view of the restaurant. Towne is located on 900 Boylston Street, Boston, MA 02115. But honestly, I forgot about the salad when this Lobster Stuffed Popover arrived at the table. Let me just tell you, during the summer I make thousands of popover at work, but nothing like this. Stuffed with warm lobster sautéed in butter, wine, and chives, this popover gets the royal treatment when it’s bathed with Lye’s Golden Syrup. View this video and see how they are made by the chef herself, Lydia Shire. Such a decadent way to start this tour! Next up was a food truck we had not tried yet, Bon Me. How they describe themselves? “Bold, fresh, and fun Vietnamese food: made from scratch and served from a restaurant and bright yellow & blue #foodtrucks! 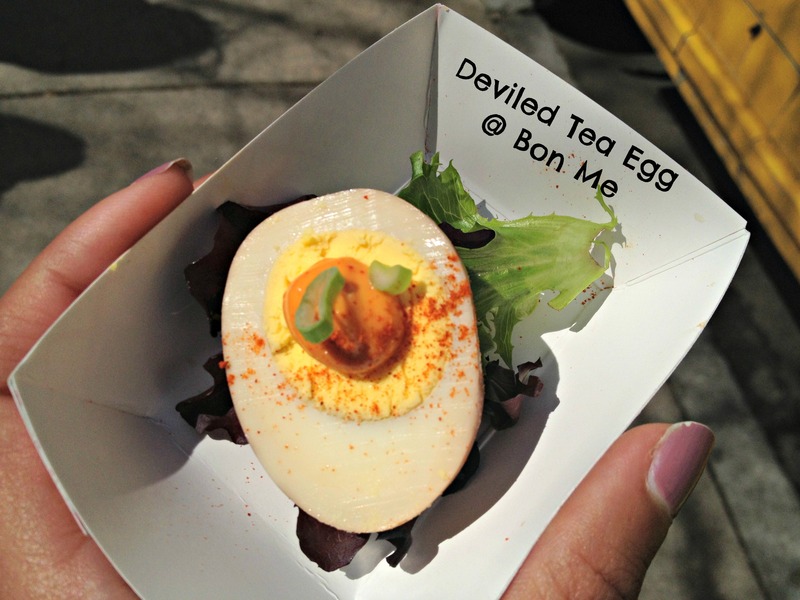 For you, Bon Me.” This truck delivered HUGE flavor packed into small bites, like this deviled tea egg – earthy, spicy, and had us craving for more! 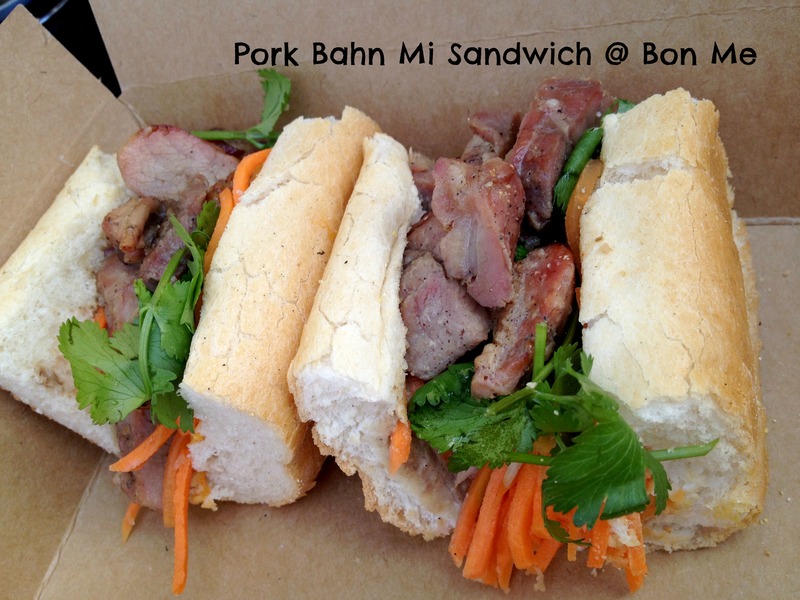 Next up, their Pork Bahn Mi with thick cuts of pork, pickled carrots, fresh herb salad and a crusty loaf of bread to capture it all. And to cool us down after it all, a glass of their Spicy Ginger Lemonade, a treat on a sunny day! Bon Me trucks are located around the city and you can check out their locations here. A quick stop at the ever-so-famous Georgetown Cupcakes sweetened our afternoon. I grabbed a Chocolate Ganache Cupcake and M. had a Vanilla x 3 Cupcake. Both were pretty delicious and moist, although my love for chocolate always prevails and my favorite was the Chocolate Ganache. 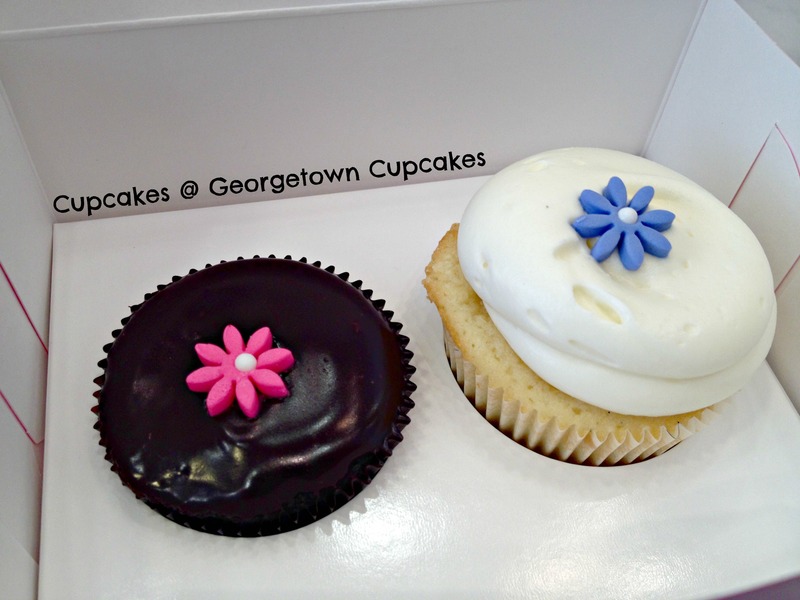 Did you know… Georgetown Cupcakes tweet a daily cupcake flavor? If you’re one of the first lucky 100 that mention the flavor, it’s free! 100 cupcakes/location/day! 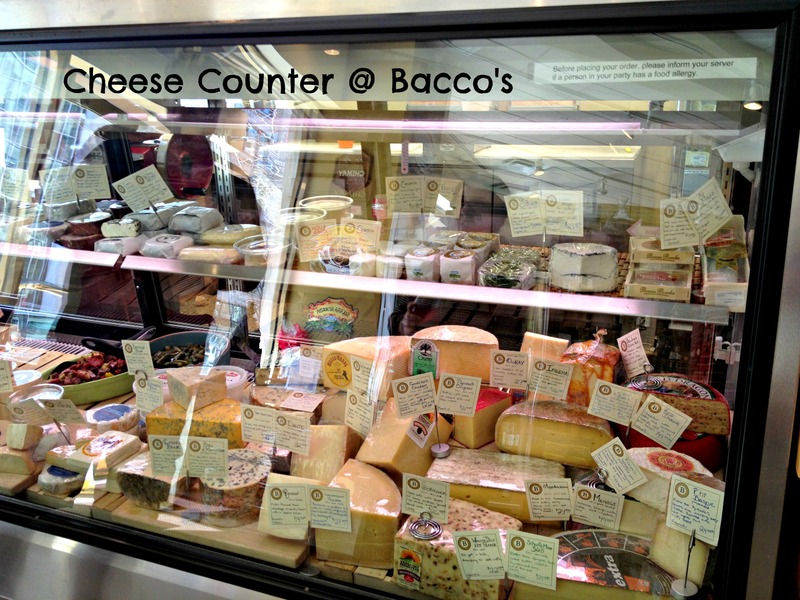 A short walk away – Bacco’s Wine and Cheese. M. instantly wanted to move into this shop! Filled to the brim with condiments, cheese, wine, cheese, spices, cheese – you get my point, cheese was everywhere! Emily, the “Cheese Wiz” (her real title, it’s even on her business cards!) lead us through a tasting of a few new products, which was very enjoyable. We took a few extracminutes and shopped around, leaving with goodies to bring back home! Bacco’s is located at 31 Street James Avenue, Boston, MA. 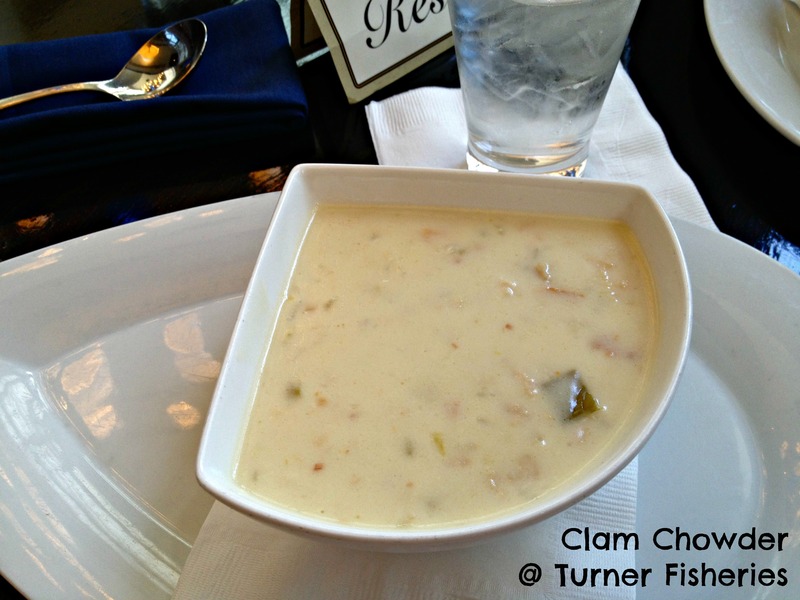 Last, but certainly not least, we walked up to Turner Fisheries to try a bowl of their chowder. Audrey had told us it was award-winning chowder and we needed to try it, since we’re chowder lovers! It’s a gluten free chowder, which made me weary – typically GF chowders are incredibly thin and lack body. This was unlike any other – rich and creamy, with great flavor! Below is the recipe for their chowder, thanks to their manager for sharing it with us! In a small pot, prepare the roux by combining the rice flour and butter. In a large pot, mix clam juice and water. Add sachet (whole spices) and simmer. Add roux to clam juice and boil. Slow cook bacon in a sauce pot until golden brown. Add butter, onions, garlic, leeks and sauté for 25 minutes. Add celery, potatoes and white wine. Let wine reduce. 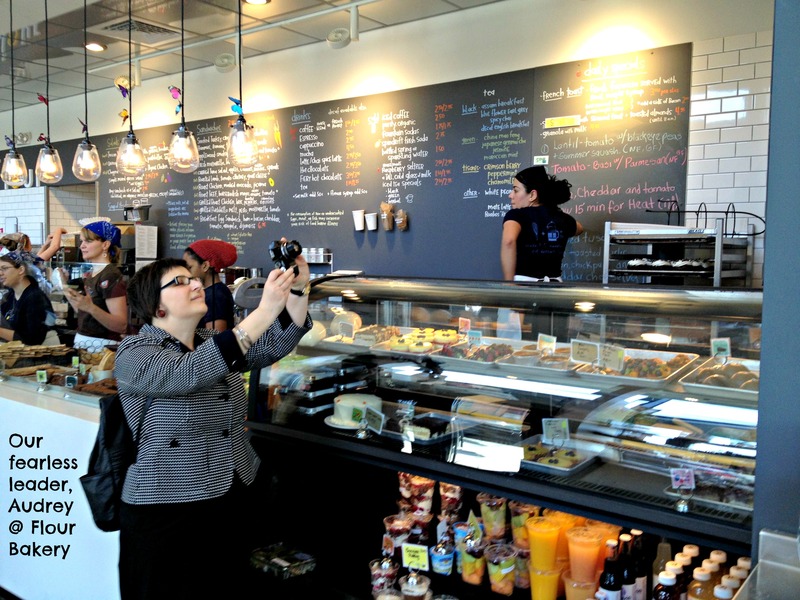 Disclaimer: Boston Foodie Tours invited us on the dry-run of this new Back Bay tour. We were not compensated for this post and share it because it was a great foodie adventure! Opinions are 100% our own. « Spring Pizza Party with Land O’Lakes! Thanks for this! It’s beautiful & uplifting And now I’m hungry!